This service manual describes functions, theory of electrical and mechanical operations, maintenance, and repair of EPL-5600 /ActionLaser 1600. Provides a general product overview, lists specifications and illustrates the main components of the printer. Describes rhe theory of printer operation. Describes connector pin assignments circuit diagmrm circuit board component layout and exploded diagram. 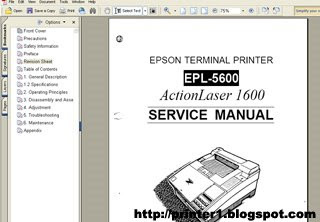 0 Response to "EPSON EPL-5600 SERVICE MANUAL"